(Me at about 7 months pregnant with Camron. 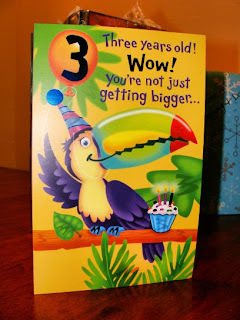 Three years ago today my first baby was born into this world. Even though I had been stuck at 3-4cm for over 2 weeks I went a week overdue. At my 41 week appointment I BEGGED my doctor to let me be induced. I had been so uncomfortable for weeks. I was scheduled to go in at 9pm on a Friday night (the 22nd). They didn't start the pitocin until around 11pm that night. By early morning on Saturday I was begging for an epidural. Contractions HURT when you're on Pitocin! 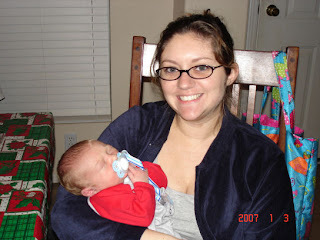 (I know that now after going through a natural labor with Brady.) Sometime after 1pm I was told to start pushing. I had no urge to push and I was completely numb from the waist down. Almost an hour of pushing went by before the doctor says, "Oh, he's sunny side up! We need to turn him." Even though I was mostly numb I could feel her doing that. Ouch! After two more long hours of pushing Camron Micheal was born at 4:42pm on December 23rd. He was 8lbs 13oz and 21 inches long. 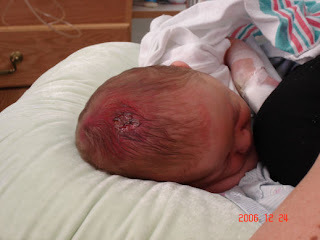 Unfortunately during the labor he devolped a sore on the top of his head which they thought to be a viral infection.. It wasn't. I think the doctor did it when she was turning him. 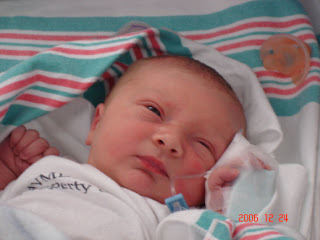 He spent one week in the NICU because of it. My husband was on deployment, I was a new mother and I had to leave the hospital alone. Luckily they were nice enough to move me into a new room the day after I was discharged and Camron was allowed to room with me. We got to go home on New Years Eve. Well, you all know he was 8lbs 13ounces.. 21inches long. Born sometime after 430 this afternoon. He's got HUGE feet, and looks just like his Daddy. Grandma Rose said that his hair is SO blonde, and his eyebrows are so blonde it doesn't look like he has any.. and even his EYELASHES are bright blonde. He has blue eyes, and a STRONG demeaner. Camron is, at the moment, in the NICU being monitored. The only thing "wrong" with him was the fact that he had some type of blisters all over his head from being stuck in the birth canal for too long. They're monitoring him for a short time, and maybe doing an ultrasound on his head, then returning him to Mommy. The hospital staff that was there when I visited said she is SUCH a strong girl! She pushed like a champ for three hours to get that lil bugger out. She was pretty wiped out when I got to see her, so it's kinda good that she gets a lil time to recoop before being a full time Mommy. Not much time, but enough to maybe catch a cat nap. Thanks everyone for your prayers, keep em comin! And she'll be posting her birth story when she gets home, along with a MILLION pictures I'm sure :D Hopefully she'll be home tomorrow afternoon/evening sometime. If not, she'll be coming home on Christmas! What a great present, huh? Like I said, it was taken with my camera phone. And it's not of him, it's a picture of him on the digital camera. He was already gone when I got there. Happy Birthday my little man! You're growing into a smart and independent little boy. You'll always be my baby boy to me though. Thanks for choosing me as your mommy. I love you! Haha! LOVE the look on his face. So goofy! I called over to say Happy Birthday to your adorable son!! AWW! Happy Birthday! Crazy how time flies, right?! I hope he has a great birthday! Wishing you and yours a very happy holiday. Merry SITSmas! Hey SITSta - wishing a Merry Christmas and a happy birthday for your little one. Adorable! 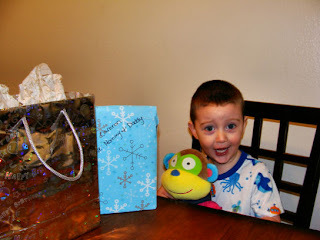 I hope he had an awesome birthday!